bilirubin that may cause the gums, white parts of the eye and feces to become yellow or jaundiced. group type from either the mare or the stallion. If the stallion and mare have the same blood group, the problem cannot occur. occur only if the blood group of the foal is different than that of the mare (i.e. inherited from the stallion). is rare in maiden mares. severe depending on the amount of antibodies ingested and absorbed. without the blood groups ‘Aa’ or ‘Qa’ to a stallion with those blood groups. However, this is not very practical. diagnostic laboratories around the country. Figure 1. 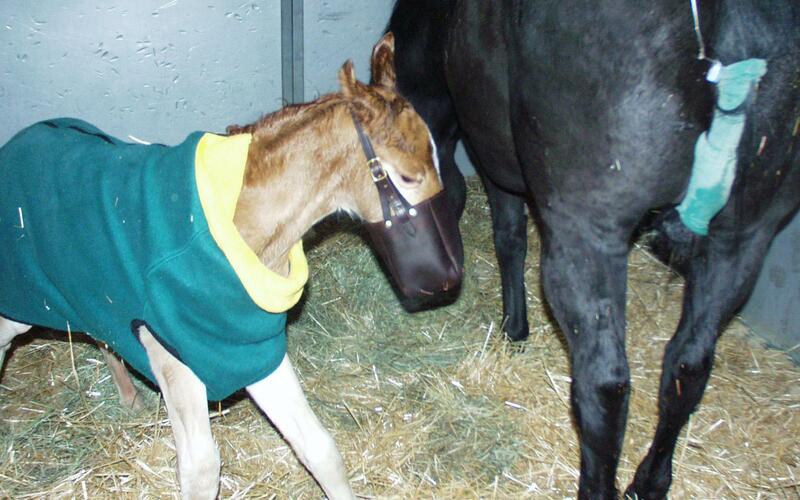 Photo of a foal wearing a muzzle to prevent nursing.